Make cheesecake parfaits that are just as scrumptious as they sound. 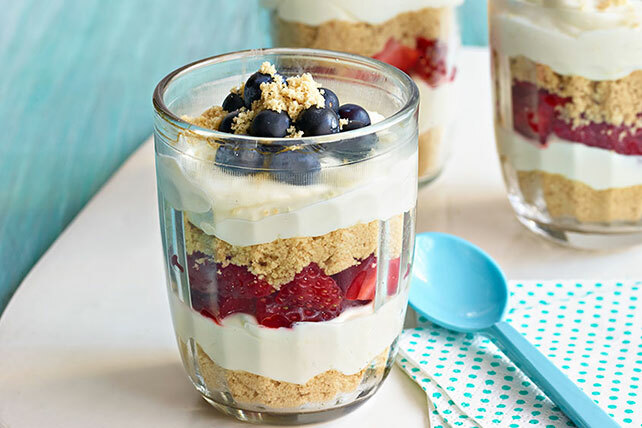 PHILADELPHIA Cheesecake Parfaits are made with cream cheese, berries and whipped topping. Beat cream cheese, sugar, milk, lemon zest and juice in medium bowl with mixer until blended. Gently stir in COOL WHIP. Reserve about 3 Tbsp. cookie crumbs. Spoon 1 Tbsp. of the remaining cookie crumbs into each of 10 parfait glasses; top with 2 Tbsp. cream cheese mixture. Cover with layers of strawberries, remaining cookie crumbs, remaining cream cheese mixture and blueberries. Trim 30 calories and 5g of total fat, including 3g of sat fat, per serving by preparing with PHILADELPHIA Neufchatel Cheese. Substitute any seasonal fruit for the strawberries and/or blueberries in these colorful parfaits. Place completely unwrapped packages of cream cheese in microwaveable bowl. Microwave on HIGH 25 sec. or just until softened.